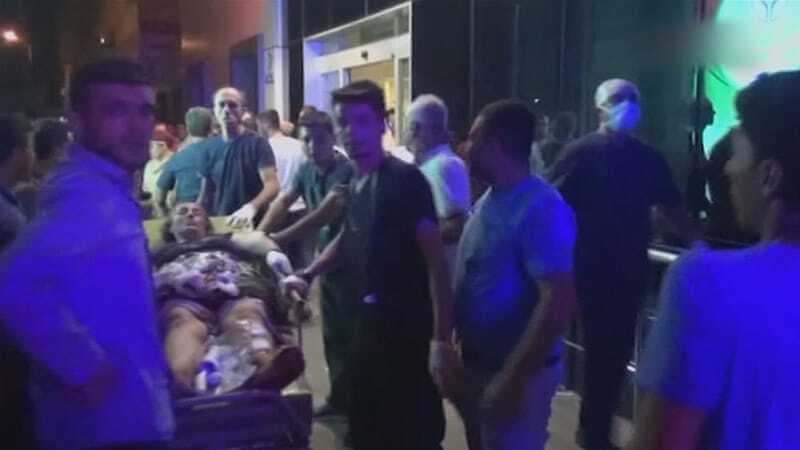 At least 30 people have been killed and some 94 more injured in a blast that targeted a wedding ceremony in Turkey’s southeastern Gaziantep province. According to Gaziantep Governor Ali Yerlikaya, the “terror attack” took place in the Sahinbey district’s Akdere neighborhood late on Saturday. Earlier, the governor’s office put the death toll at around 22. A parliamentary deputy from the governing Justice and Development Party (AKP) has said the Daesh Takfiri terrorist group is responsible for the attack. "We wish God's mercy for those who have lost their lives in this cruel attack, and for the injured, a quick recovery," said a statement released by provincial governor's office, confirming the incident’s death toll. "We strongly condemn this cruel terror attack and those carrying it out," it added. After the blast, the pro-Kurdish Peoples' Democratic Party (HDP) announced that some of its members were present at the wedding where a large number of women and children were also present. Turkey has suffered a series attacks by Daesh and Kurdish terrorists over the past year, the deadliest of which being a gun and bomb attack on Istanbul's Atatürk international airport, which claimed the lives of over 40 people and injured over 20 more. The bombing incidents increased especially after last July when the country launched a military campaign against militants of the outlawed Kurdistan Workers’ Party (PKK) in the southeastern border areas. The Turkish military has also been conducting offensives against the positions of the group in northern Iraq. On Thursday, a bomb attack -- claimed by the PKK -- and clashes with the militants killed at least six members of Turkish security forces in the eastern parts of the country. The attack occurred hours after six people were killed and more than 250 people injured in two separate bomb blasts that hit police stations in the city of Elazig in Eastern Anatolia and in a town in the province of Van. According to the latest toll provided by the state-run Anadolu news agency in July, more than 600 Turkish security forces and over 7,000 PKK militants have been killed since the collapse of their truce agreement in 2013. Ankara says all of those killed in its operations were PKK members. Rights campaigners and Turkey’s pro-Kurdish political parties challenge the figure, saying many civilians have been killed.